Pop music and literature are two separate miracles, the silent shout and the screamed secret, two wonders working to their own, different and divided rules. Each has seductive thrills of its own. Pop music has no need to attain the form of literature to achieve greatness. A great many of its practitioners have thought otherwise however, and there have been countless pretenders of one form to the other. Whether its Iron Maiden raiding Coleridge or The Eurythmics mugging 1984, the straightforward homage, sad to say, usually rings false. Frank Zappa’s denunciation of rock music writing was “like dancing about architecture” and the ‘category error’ is just as stark the other way. The essence of one does not easily translate into the other. That doesn’t mean it is not possible however, that the breadth, sway, richness and ambiguity of literature cannot be captured in song. A true – successful – literary sensibility in pop music is a rare thing indeed, but it can happen. It doesn’t come from showboating references but a much deeper understanding of the texture of literature. Colin Meloy is firmly and defiantly in this tradition. And how he held them, How he held them, held them in. Sometimes they are self-consciously archaic, especially when the scene being captured is explicitly rooted in the past (i.e. “and what irascible blackguard is the father?” from the Hazards of Love epic). More often than not though they are not so much archaic as parochial and particular, evoking an immediate time, place and essence. They are certainly unafraid to seem florid. Pop music, even in ‘sophisticated’ pose, usually sticks to a convention that verbosity strangles vitality and immediacy. Orwell wrote that Yeats was the exception to the rule that poets tend to avoid self-consciously ‘poetic’ language. Meloy is the exception to the rule that self-consciously literary language has no place in pop. When he sings that “Pretty hands do pretty things when pretty times arise / Seraphim in seaweed swim where stick-limbed Myla lies”, you could wince at a grandiosity that is ‘out of place’ in pop. Or you could delight at what is, quite simply, a gorgeous lyric. Beyond phraseology, further proof that Meloy’s is a truly literary style is his single-handed one man revival of the Narrative – capitalise that N! – in pop songs. Storytelling is more common in both the folk and country musical genres that The Decemberists also straddle, but Meloy is rare in bringing this back to the indie-rock sound which remains their base. And such Narratives. Laudanum-drugged French Legionnaires dreaming of home, the un-resting ghosts of poverty-stricken barrow-boys and stillborn babies, runaway 10th-century female harem slaves and 20th-century male prostitutes, vengeful sea-crew and psychopathic Ulster Protestant terrorist splinter groups, lovelorn honeytrap victims of rogue security service agents. 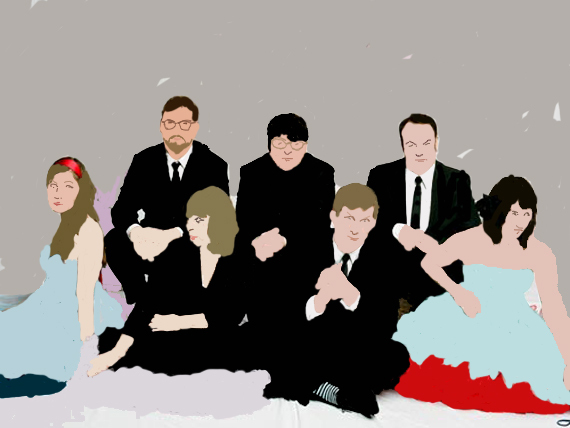 From first album, Castaways and Cutouts, until the fourth, The Crane Wife, The Decemberists proved themselves the masters of capturing the skewed short story in song. Most pop lyrics are a bastardised cousin of verse poetry, but this was a truer poetry finding its form in novel or short story prose – to emphasise the fact, the lyrics in the liner notes to Castaways are written out in prose paragraphs rather than verse style. Stories in the true sense (though usually not true stories), these were vignettes which didn’t just carve out their scenes with precision, but also gave an inner life to the characters within. The narratives do not always follow the traditional linear form, and to employ literary labels Meloy is open to the modernist as well as the realist style. ‘Here I Dreamt I Was An Architect’ employs a drugged, dreamlike drift in the narrator’s identity across different nations and ages. ‘Red Right Ankle’ takes the blood vessels and sinews of its eponymous appendage as the narrator of its first verse. Disjointed, displaced in time and space, they are narratives nonetheless. A broadly realist short story style predominates however, and this aspect reached the perfect peak in this form in 2005’s Picaresque, which, as its title suggested, captured the perfect form of tarnished anti-heroes battling through a colourfully grimy, chaotically uncaring world. Picaresque showed also however that the Meloy’s sense of the literary goes beyond the Narrative. Its poppiest moment – ‘Sixteen Military Wives’ – is a sardonic satire on the Iraq invasion, sneakily taking the back-door route of mocking its media coverage: skewering the TV commentators, from distinguished academy chairs, to pontificating celebrities with “Wretched chequered lives” and “pristeen moderate liberal minds”. 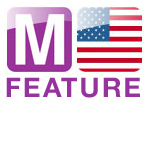 The unreal, disjointed disconnection between the fatuous media circus and the bereaved tragedy of the military wives is presented without a hint of either mawkishness or heavy didacticism, making its point all the more poignant, and wrapping it in a euphoric chorus. This isn’t a narrative as such, there is no beginning or end, nothing “happens”. But it has still evoked characters, and illuminated themes in a startlingly original way, shedding light into corners previously dimmed by dull cliché and repetition. Another song without a narrative is ‘Angels and Angles’, a brief, slight gorgeous meditation on the “angles” of a loved ones features as she fills in a crossword. A finely carved sculpture of a song, fragile in its material but immortal in its robust finish, a miniature marvel to behold. This is why Meloy is a literary songwriter, and not just a yarn-spinner. Meloy perhaps reached his zenith on the same album with ‘The Engine Driver’. Against an impossibly gorgeous, languid, sonorous backing, he takes on a variety of brief two-line personas with their own brief, terse narrative – an engine driver “on a long run, so will be my grandson”, a money lender who has “fortunes” but is “ever tortured” – but whose chorus whittles these away to reveal that each one of these personas, these forays into fiction, are just the sad standbys, the necessary imaginary retreats of an author “writing pages upon pages trying to rid you from my bones”. A strange, post-modernist self-commentary (is the writer of fiction himself still a character? Or is it, finally, Meloy himself?) is injected with the vitality of raw, pulsing emotion to create a song which nourishes the mind as surely as it grabs at the heart. It also allows it the true status of the literary song. And yet literate pop is not literature, it still needs a voice, not the authorial tone but a flesh and blood trachea that makes a noise. Meloy has self-deprecatingly dubbed his singing voice “my famous donkey bray”. “Mannered” would be a polite criticism, “whiny” a less polite one, and when one considers this voice is at times singing interpretations of folk tales from medieval Irish mythology, it is easy to see how some may think at first, second and even third listens that here is the nadir of clever-clever self regarding “college rock”, to coin a hideous phrase. And yet, ultimately, it is the raw, naked tremulousness of this voice which gives the final spark of life to these songs. What at first sounds mannered quickly shows itself as an instrument whose every stray inflection counts, not a syllable goes astray. When the word ‘tramp’ in ‘We Both Go Down Together’ extends one syllable into four, the effect is startling, and an anguished truth carries along its contours. Some of the tales Meloy tells are so far out and fanciful they would be easy to dismiss as arch or pastiche. Sometimes, undoubtedly, the melodrama is played for laughs, as with ‘The Mariner’s Revenge Song’, a bloody, syphilis-ridden tale told from within the belly of a whale. Often there is an air of whimsy. But even in his most playfully outlandish narrative realms, Meloy’s red-raw voice, backed by the pitch-perfect instrumentation, manages to give the characters a hauntingly real emotional resonance – yes, even from inside a sperm whale’s stomach. With fifth album The Hazards of Love, the band moved from the short story to the novel, from the song in a single to a full-blown album length rock opera. In theory this should be the very height of overblown prog-rock pretension, especially when you consider that the plot concerns the star-crossed love between a young maiden and a fawn which shape-shifts into a man under the jealous tutelage of the Queen of the Forest… And yet, what could so easily seem risible, instead becomes magical, an emotional odyssey which sweeps you along with the characters, and showing that the narrative is a runic metaphor for the travails of the heart as well as a baffling medieval oddity. It is that too though, and the idiosyncrasy only in increases its lunatic appeal. Its centrepiece, ‘The Rake’s Song’, is an amazing piece of work which shows in the starkest relief the tension between the emotional honesty of Meloy’s delivery and the outlandish nature of the subject matter. We are once again into Meloy’s most melodramatic territory, a ‘rake’ who after his wife’s death following “her womb spilling out babies” seeks to “divest his burden” so he can live the bachelor life once more – by murdering each one of his children. This character is so monstrous as to be Tex Avery cartoonish and, on one level, it is certainly black humour. And yet once more that voice gives it a terrifying edge of sincerity. As the cod-Dickensian argot of the rake’s chorus “Alright! Alright! Alright!” ritually repeats itself the effect is certainly funny on one level, but genuinely sinister and shocking on another. This is the success of duality, the marriage of tragedy and comedy which the greatest works of literature attain. Written while in pastoral retreat in the remote Oregon countryside for a year, with 2011’s The King is Dead, Meloy has swung the pendulum altogether away from the narrative epic of Hazards of Love – some would say one extreme to another. These are short, straightforward songs with neither extended nor individual story-telling narratives between them. 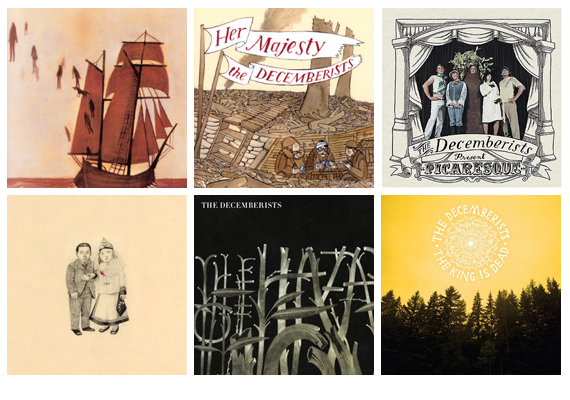 At first listen The Decemberists aficionado may feel short-changed. With these relatively amorphous, impressionistic outings, where is the intellectual grandiosity which makes them the weird wonders they are? This however, is to forget the other more subliminal elements in The Decemberists’ make up being brought to the fore here, the sense of place (the rural West) more subtly hewn, itself bringing out a deeper edge to the contours of nerve-scratchingly raw emotion in its examinations of lost childhood and lost children, of joyous working solidarity and defiant class struggle, and most of all of the infinite sublimities of nature to be found in the year’s seasonal turnings. This is clearly Meloy at his most personal, not cloaked amid his ever-myriad personae. The paintings created are from a more subdued but no less beautiful pallet. Perhaps this is the album where the music and that beautiful voice are left to do the heavy lifting, but still there is time for a comedic dream about Armageddon, where apocalyptic Andalusian tribes lay waste to the world as our hero is exiled to a new civilisation below ground “and I’ll be crowned the Community Kick-It-Around”. Understated-ness, it seems, can only go so far in Meloy’s world. Long may that remain so. Literature is sometimes held to be an elitist form. In strict literal terms it is, if by elitist we mean staying true to individual vision and not allowing itself to pander to crowd pleasing, quasi-democratic mediocrity. The Decemberists are the very definition of the ‘cult’ band, one whose followers have a fevered adoration to their idols and a snobbish view of the outsiders who will never “get it”. And yet this proud secret of their bookish acolytes are now finally breaking into the mainstream, with The King Is Dead topping the US charts, something beyond anyone’s most fevered imaginings even a year back. Already you can hear the whispers of “sell-out”. Yet this would be as unfair as it is untrue. There is no need for Meloy to water down his literary sensibility as wider popularity beckons, and nor has he. And nor, I strongly suspect, will he. One last literary parallel: what is at first denounced as a perverse irrelevance, of interest to only a cliquish minority, often comes to be accepted as genius by a much wider audience a few years down the line. We shall see. In “I was meant for the stage” Meloy claims his destiny is for applause and derision alike. There will never be any shortage of the latter from those who think that the literate has no place in pop. But a growing number are applauding, and this applause is sweet music itself.